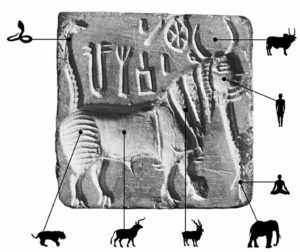 What were the seals used for in the Indus Valley? Seals were utilized to make a fixing, or positive engraving while doing trade. Sealings were utilized as a part of antiquated circumstances for exchange. They would be made on earthenware production or the mud labels used to seal the rope around bundles of goods. A huge number of seals were found from the locales, typically made of steatite, and periodically of agate, chert, copper, faience and earthenware, with excellent figures of creatures, for example, unicorn bull, rhinoceros, tiger, elephant, buffalo, goat, wild ox, and so on. The reason these seals existed was mostly for trade and business. They were additionally utilized as ornaments, carried on the people of their proprietors, maybe as present day personality cards. 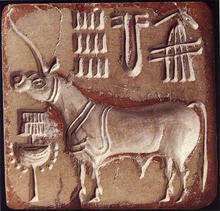 Standard Harappan seal was 2 x 2 square inches. Each seal is engraved in a pictographic content which is yet to be deciphered. The seal depicts a human figure seated cross legged. Two antelopes (deer) are shown below the seat (nearby his feet). An elephant and a tiger are depicted to the right side of the figure, while on the left a rhinoceros and a buffalo are seen. The figure has a three horned head. A few seals were additionally been found in Gold and Ivory.